October 6, 2011 - Memphis is the 35th airport to commission ASDE-X, which greatly reduces the potential for collisions on airport runways and taxiways by allowing air traffic controllers to detect potential conflicts and take appropriate action. Airport Surface Detection Equipment, Model X, or ASDE-X, is a runway-safety tool that enables air traffic controllers to detect potential runway conflicts by providing detailed coverage of movement on runways and taxiways. By collecting data from a variety of sources, ASDE-X is able to track vehicles and aircraft on airport surfaces and obtain identification information from aircraft transponders. ASDE-X works by monitoring real-time surface activity taken from a variety of sources, including radar, sensors from the satellite-based surveillance system called Automatic Dependent Surveillance ? Broadcast, multilateration sensors and aircraft transponders. ASDE-X fuses this data and projects them on color displays that allow controllers to see the precise location of aircraft and transponder-equipped vehicles on runways, taxiways and approach corridors, as well as aircraft flying within five miles of the airport. The transponders provide the identity of each aircraft and vehicle. ASDE-X is especially helpful to controllers at night or in bad weather when visibility is poor. An enhanced safety logic spots potential collisions and provides visual and audible alerts to controllers. 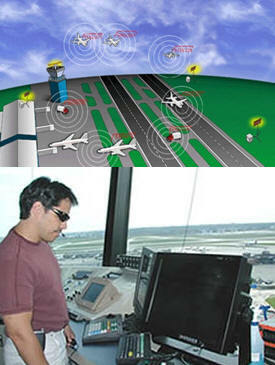 Originally the FAA installed 38 ASDE-3A radar systems at the nation's busiest airports. The cost-effective alternative to the ASDE-3/AMASS capability, referred to as ASDE-X, is one of the first new runway safety program technologies aimed at improving ATCS situational awareness by providing tools to supplement their tasks (McAnulty, Doros, & Poston, 2001). The data that ASDE-X uses comes from a surface movement radar located on the air traffic control tower or remote tower, multilateration sensors, ADS-B (Automatic Dependent Surveillance-Broadcast) sensors, terminal radars, the terminal automation system, and from aircraft transponders. By fusing the data from these sources, ASDE-X is able to determine the position and identification of aircraft and vehicles on the airport surfaces, as well as of aircraft flying within 5 miles (8 km) of the airport (selectively up to 60 nmi). The first ASDE-X became operational at General Mitchell International Airport in Milwaukee in June 2003. Below is a list of the 35 airports with the system.